Katie is a dressage professional located in Folsom, Louisiana at her own Runnymede Farm, training horse and rider from beginner to Grand Prix. Katie grew up at Runnymede where her parents bred and imported Dutch Warmblood horses since the early 80s. After Katie returned from a stint as work student to USA Olympian Steffen Peters, her parents retired the breeding program and handed the reins over to Katie to turn the farm into the top notch training facility it is today. Katie is a former advanced young rider having competed in the NAJYRC as well as having been chosen to represent the United States in the small tour at the CDI*** Sydney (Australia). 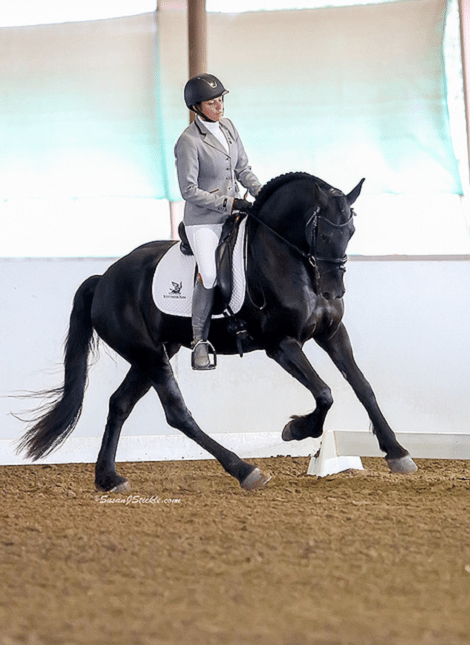 After taking a long show hiatus to train and hone her skills, she has recently made it back into the ring with her exceptional Friesian mare, Freyja of Riverview, whom she plans to bring up into the FEI levels.